The Pebble is the smallest, lightest and smartest smart watch to date. But is it the future of time or late for its own party? What time is it? Time you had a smartwatch, if you believe the tech Twitterati. The much-discussed but as-yet-unseen Apple iWatch is responsible for some of the hype – we hear it's going have 3D mind control. But just as buzzworthy is the plucky Pebble, a Kickstarter darling that persuaded over 70,000 backers to hand over a cool $10m to bring it to life. Now it's finally shipping (in small numbers), Pebble looks like the smartest smart watch around: cleverer than Kickstarter rival Cookoo, lighter than MetaWatch, more powerful than the Motorola MotoActv and more physically existent than the iWatch. But is it worth your wrist real estate? From phones to cameras, glossy black rectangles have pretty much conquered the planet. If strapping one on your wrist feels strange, however, the all-plastic Pebble also comes in white, grey, red and orange finishes. 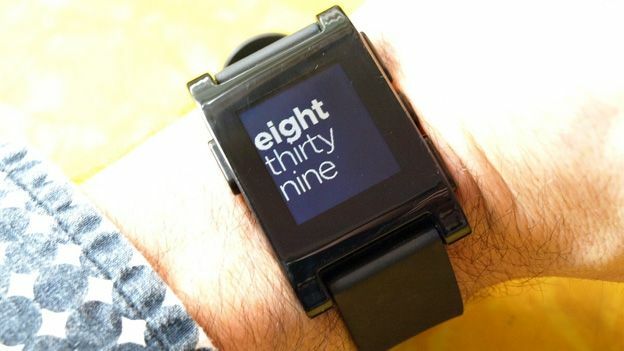 The Pebble's smooth, seamless front face curves into a utilitarian (but replaceable) rubber strap. The overall effect isn't cheap, exactly, but no one would mistake it for a premium timepiece. At 10mm thick, the Pebble also feels chunky, a sensation that isn't helped by four oversized side buttons. The whole unit is both sturdy and fully waterproofed down to 5m. The word Pebble is etched into backplate – and our early unit also carries Kickstarter Edition branding. Electrophoretic (e-paper) screens are powering the smart watch revolution. This 1.26-inch, 144x168-pixel example is simply stunning in daylight, bursting with contrast even from behind sunglasses. A motion-sensitive backlight helps in darker conditions – although you can turn it off if you're distracted by sporadic flashes of light when moving your arms around. The resolution is fine for smoothly scrolling text and numerical watchfaces but disappoints for analogue displays, where graphical clock hands can look jagged. You can adjust the font size for notifications: leave it on 'large' unless you have owls or hawks in your family tree. Our test sample's display developed a sporadic flicker after about a month, a problem that other users have also noted. At the moment, just weeks after the Pebble's launch, the app landscape is fairly barren. There are a dozen or so watchfaces to download – the best of which are nicely animated. What makes a watch 'smart' rather than just flexible is its ability to pair over Bluetooth with a smartphone. Official Pebble apps for iOS and Android let you beam notifications to the watch – checking your texts, emails or Tweets with a flick of the wrist is way less socially awkward than fishing a phone from your pocket. Calendar alerts also work on iOS, although not timers, and there are some hiccups with social media updates on some platforms. While texts show the name of your contact, incoming calls just flash up the number – you can accept or reject the call by hitting a button. There's no voice recognition or ability to reply with a standard text or email. You can also pause or skip music remotely. Third party offerings are limited to a couple of Android notification apps, although Pebble promises smartphone GPS-enabled golfing, running and cycle apps shortly. A magnetically-latching USB power cable slips neatly on one side of the Pebble to add a touch of class, although no charger is supplied. There's no indication that the Pebble is charging (or fully charged) but we found an hour or two generally does it. From fully charged, the Pebble is supposed to last nearly a week. Unfortunately, our test unit flashes up a low battery warning after less than three days, and dies completely just seconds later. Communicating with the Pebble also has an effect on your phone's battery. We found our iPhone 5 running low about an hour earlier when paired. The Pebble might not be a truly smart watch – its features are too limited and the hardware too buggy for now - but it's still smarter than other watches out there. For busy people who need to screen messages and calls, it's well worth the hassle of frequent recharges – and upcoming GPS apps could make it truly essential. Well, until the launch of Apple's solar-powered, virtual reality iWatch at least.